All Cisco 1900 Series Integrated Services Routers (ISR) have modular design that allows for reuse of a broad array of existing modules that meet business requirements while maximizing investment protection. The Cisco 1941 Series offer increased levels of services integration with data, security, wireless, and mobility services enabling greater efficiencies cost savings. Multi-Gigabit Fabric enables high bandwidth module to module communication without compromising routing performance. 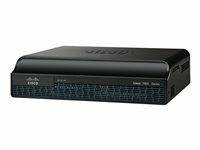 The Cisco 1900 Series offers intelligent power management and allows the customer to control power to the modules based on the time of day. Cisco EnergyWise technology will be supported in the future.